Dedicated to the Goddess Durga, the Sheetla Devi Temple is located in Una district of Himachal Pradesh. 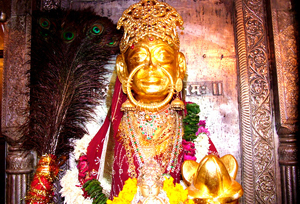 It is placed nearby Chintpurni Devi Temple in Bharwain. A good number of devotees throng this holy place to take the blessings of Goddess Sheetla Devi and pray for their prosperity and success in life. Perched on the top of the hill, this temple is considered as one of the ninth Devi temples. Local residents of this region are very kind, welcoming and helpful. So, if you are in Una, you must visit this holy shrine and make your trip blissful.